This week we’re showing the film Erasing David at the museum as part of our events for the Sense and the City exhibition. The documentary explores the use of surveillance technology in modern Britain, so volunteer Jon Burdett has picked out ‘Secure Beneath the Watchful Eyes’ by Mark Thomas. He explains: ‘The movie is about documentary maker David Bond’s attempts to disappear from Britain’s ubiquitous CCTV cameras, challenging two private detectives to track him down whilst he goes on the run. Can he manage it? 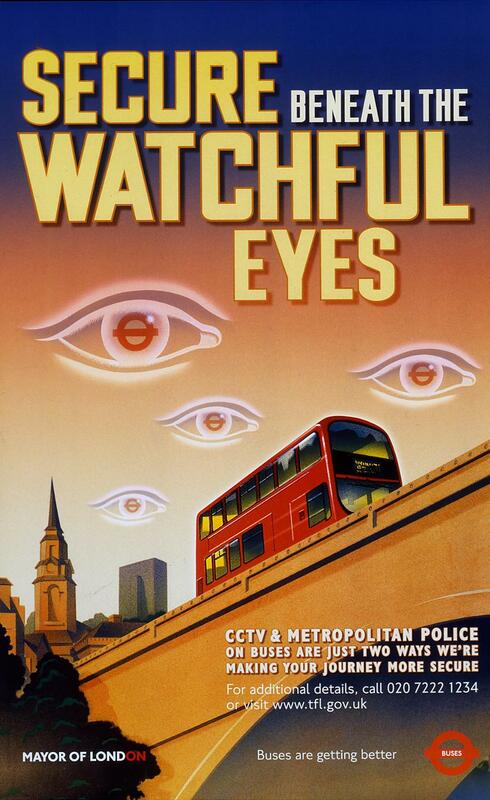 This poster from 2002 was made to reassure the public that the use of surveillance helps to keep the transport system a safer place. The text says: ‘CCTV & METROPOLITAN POLICE ON BUSES ARE JUST TWO WAYS WE’RE MAKING YOUR JOURNEY MORE SECURE’. There was also a leaflet done explaining the measures being taken to improve security. To me, those eyes in the sky are a bit Big Brother and bring George Orwell’s famous novel 1984 to mind! Erasing David will be shown on Friday 9th December 2011 18.30 – 20.00. Sense and the City – Get Involved! This summer a new exhibition about London will open at the museum – and you could be part of it! Sense & the City explores the powerful new forces that are shaping the way we live, work and travel in the city. GPS, pervasive wireless, sensing, near field communication, multi touch surfaces, open data, smart phones and a blizzard of new Apps are combining to redefine our urban relationships. Data visualisation is beginning to work with these digital riches to help us make deals, be sociable, navigate and network in powerful new ways. There is a wind of change in London – Sense & the City will harvest straws in that wind and test which of them have most significance for the future. Open data – What does the ‘democratisation’ of data mean? And how do we deal with privacy and protection concerns? Real time – How does real time information from the Capital’s systems change urban behaviour? Mobility – Will crowd sourced transport become real? What is the future for autonomous personal vehicles? Is there a ‘cycling tipping point’ when machine powered vehicles naturally give way to human powered ones? Sociability – How is social media changing the way we use London? How are new markets opening up? Is the future of business more social? Navigational signage – Sensing and information carrying surfaces are changing the information provided to travellers – how far can this go? Blue Sky – How might we live, work and create in London of the Future? 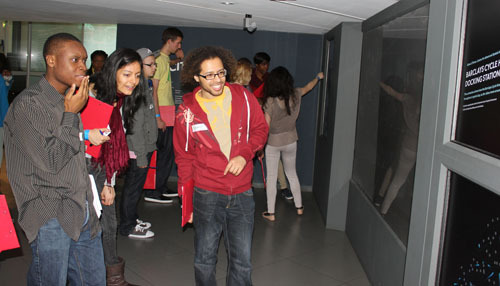 The interface allows us to show a range of visualisations – we are focusing on movement systems and London. In the first instance email us with information about your work – pointing to your site, linking to Vimeo clips and any App store links. We are not definitely promising that you’ll be in the exhibition but we’d like to hear from you. If we like what we see and it fits then we’ll be back in touch.